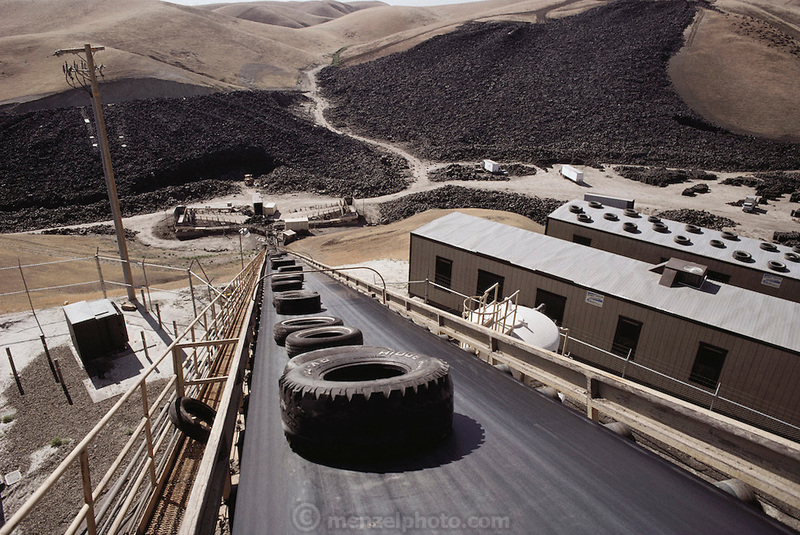 Used tires entering a prototype burning-burning power station in Westley, California. The tires are used as fuel to run an electricity generator. It is estimated that one tire can serve the energy needs of the average northern California household for a day. A tire mountain containing around 40 million tires dominates the landscape (background); the plant is expected to burn some 4 million tires annually. Several environmental protection systems reduce emissions from the plant; a smog-control system neutralizes nitrous oxides, a scrubber system removes sulphur & a giant vacuum cleaner removes fly ash. Both the sulphur & the zinc- containing fly ash are recycled. (1988).